About every three weeks or so, Spago Executive Chef Eric Klein decides to change things up a bit and feature a $29 prix fixe lunch centered around the cooking of some exotic locale. He’s featured Filipino and Korean food (among others) lately, and last week it was his take on Morocco that brought us to The Forum Shops. Okay, that’s a lie. What also brought us to The Forum Shops was the chance to see how an uber-Alsatian chef does with the white truffles he had on hand, and to get a taste of his white truffle ice cream — the ultimate in dessert decadence. And, of course, there was the smoked salmon pizza, and the chance to kibbitz with Norm! and Robin Leach for awhile — and listen to them tell hair-curling tales of celebrity folly in our humble burg. Yes, it was all those things that brought us to Spago last week, and to people watch at what is still one of the most fabulous restaurants in all of Vegas. Of the Moroccan dishes, Klein’s lamb was perfect, the flaky pastry enclosing the chicken in the cigar-shaped briouat was a thing of beauty, and the pistachio cake tasted like it was just made in Marrakesh. At $29, these three courses are a steal. And let us not forget the white truffle pasta and ice cream (neither of which ELV paid for), that are about the last word in the best use of this tuber. 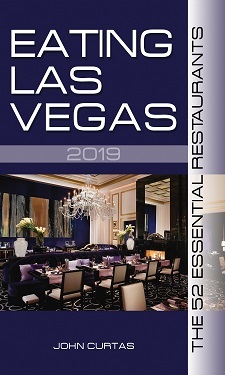 FYI: In a little over a month, Spago Las Vegas celebrates its 17th birthday and, at the same time, the birth of the Las Vegas culinary revolution. We don’t know what Klein will be cooking up for the occasion, but he’s promised to post it on our Facebook page, and we’ll be there to gobble up the first bites of whatever he’s dishing out. I haven’t been to Spago in a LOOOOONG time, but I guess I should give them another try some time soon. I’m not into over-corporatized chain food factories, but it seems Spago may have avoided the fate of far too many other Wolfgang Puck locales (like Orange County’s, don’t get me started there!). I’ll have to give them another chance soon. I’m not a Puck fan either atdleft, but Spago does a lot right. And the lunchtime people watching is hard to top.